Euroclads latest top of the range machinery allows us to custom fabricate an almost endless range of sheet metal supplies for roofing contractors, general public along with our own specialty install products. Our Quadro profiling machine is a versatile and multi-functional profiling shaping system. 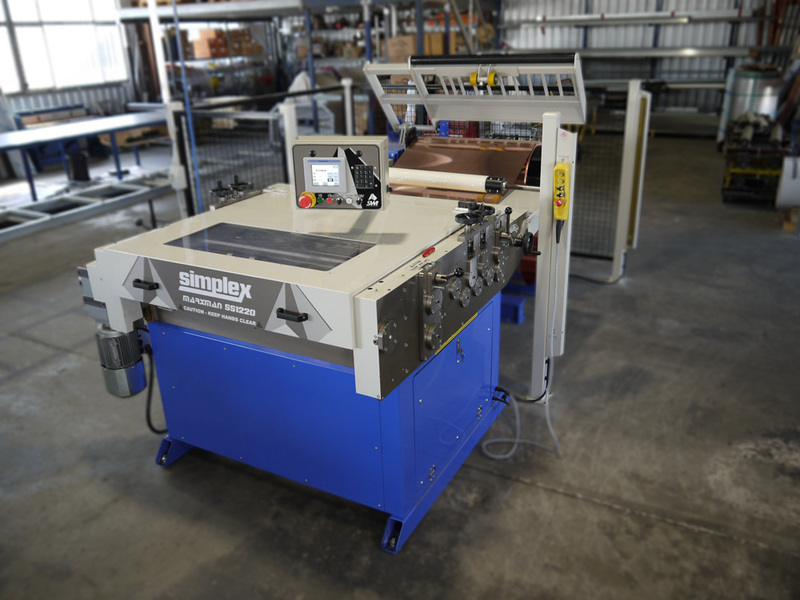 The basic machine is designed to produce sheet metal profiles for a large variety of applications with a user-friendly system and very short retooling times. The profiling machines exchangeable cassette system with 10 or 12 forming stations provide for very short retooling times for different profiles including: Standing Seam (Angled Standing Seam), Nail-Strip , Snap-Lock and Interlocking Panel (or V25 Panel) in varying rib heights. This means that the Quadro machine can be used effectively and economically for a variety of different profiles and rib heights. The ingenious design allows us to select the required panels and profiles our clients require to manufacture orders faster and more efficiently. The SWI Marxman Slitter remains the benchmark for small, medium or large slitting & blanking operations. Clever design, simple operation and now, the world’s smartest slitter knife locking system. The recent addition of this machine has not only allowed us to continue shortening production time on orders but also focus on fine tuning the quality of finished products for our clients. Its key features including straightening rollers and precision slitting knives achieve a more accurate and smooth finished product. This Swiss made 6m OEMB Origami long length CNC folder/slitter is capable of folding to all of your architectural requirements. Tapered angle standing seam roofing panels, long length flashings/ barges/ hips/ valleys are all capable with this computer operated touch screen machine.